I'm mentioning favorite blog posts today ... great ideas abound ... and the challenge is on! First up is Rockstar Math Teacher's Google Form quizzes. What caught my eye is that she made five short quizzes on the same topic - a topic her students are struggling with! That means she can work those students over time and they can keep taking quizzes until they show mastery! The quizzes are done, they are easy to grade, and the progress is available in a spreadsheet! In my algebra 2 class, I might do this with solving equations and factoring the simpler quadratics - skills I need students to have but don't have time to practice in class! How could you use Google Forms to help students who need extra practice? Or what do you use instead? While we are mentioning Google Forms ... Alice Keeler (all things Google guru) posted that you can now put images in as answer choices in Google Forms! That's a huge help to math teachers who might want to use graphs or images of equations in multiple choice questions! Check out the details here. Will images in answer choices be a help to you? If you are wondering how you will keep up with blogging during the school year, try the Sunday Summary! I loved reading Shelli's summary this past week. It's honest, newsy, has a teaching idea in it ... it's inspiring to peek into other's teaching lives! How might you summarize your week at school? And thinking about a peek into how other folks teach ... check out this post about Meg ... Dave Sabol has started a series, "How I Teach!" And Meg is first up! 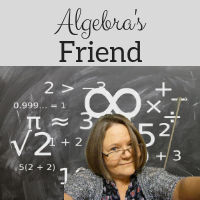 Find out what she has in her hand when she is teaching ... and her favorite "life" hacks! For the real deal ... why not join the "Observe Me" movement! Check out the call to action on Robert Kaplinsky's post! Observe, be observed, and grow! It's a great idea! Have a great day! Thanks for the shout-out! :) I'm hoping that I can actually keep up with blogging this year.